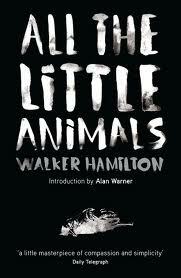 All the Little Animals by Walker Hamilton is an interesting rediscovery, brought back into print over forty years after its original publication (in 1968) by Freight Books at the suggestion of Alan Warner. Warner was asked by Freight Books founder Adrian Searle if he knew of any forgotten Scottish novels that he felt deserved to return to print and he immediately suggested Hamilton’s debut novel. Hamilton’s early death (in 1969 aged only 34, but with one further novel puiblished) and the novel’s English setting perhaps go some way to explaining why the novel has been forgotten, though it is fair to say that many other Scottish novels from that time were only brought back into print in the 1980s. This mission gives the novel a fable-like quality, and also reminded me of J.M. Coetzee’s Disgrace, where the treatment of animals, and their corpses, becomes an important symbol of how we live our lives. The same car is also important in the novels’ dénouement. Admittedly, The Fat is a bit of a cartoon villain, but he does go some way to explain why the novel was made into a film in 1999 with John Hurt as Mr Summers and Christian Bale as Bobby, as the final couple of chapters are very much in the thriller genre. Whether the novel is a rediscovered classic or not is really beside the point; the real question is whether it deserves to be back in print. The answer to that is an unequivocal yes: it’s interesting, eccentric and thought-provoking, and well worth reading. You are currently browsing the archives for the Walker Hamilton category.